You gotta love this job. Tuesday night, and I find myself standing in the heart of the City chatting to the nice people from Lanson, having my glass topped up with Champagne by a lovely young French man (originally from the Champagne region in France, natch) from a magnum of Gold Label Vintage 98. Not bad, eh? The hosts for the evening were Searcys, the clever lot behind the bar found at the tip of The Gherkin and St Pancras’ Grand (although can somebody please explain to me how this is Europe’s longest champagne bar?). 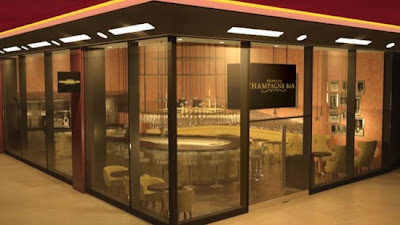 Apparently it was high time that London had another champers bar – we are coming out of a recession after all, so why the hell not? The Searcys company is known for prize locations, and venues can be found dotted around various London hotspots, such as The Hurlingham Club, The Commonwealth Club and Inner Temple. Basically, anywhere that requires a black AmEx card, an SW1X postcode, or a proven blood link to minor royalty. It’s mademoiselle actually, but go on then. Given Searcys’ penchant for exclusivity, I found it slightly odd, sandwiched, as I was, between City gents and glamorous young things, to be staring out of the glass walls into Banana Republic on one side and The North Face on the other. The One New Change shopping centre is the home to Searcys’ new Champagne bar. This Champagene bar is a small bar, tucked away in the middle of the mall, presumably aimed at those who simply can’t manage an afternoon’s shopping without a glass of bubbly to fortify them. Don’t mind if I do…wait a minute, what the…? The low point of the evening was the moment I put the sickly sweet, faintly chewy macaroon sandwiched together with foie gras in my mouth. This was a genuinely disastrous combination, and of all the many, many canapés I have plucked from lofty silver trays in my time, this was hands down the worst I’ve ever tried. My friend watched with amusement as my expression went through several stages of grimace. What a waste of good goose liver. Still, it didn’t seem to stop the besuited and bebooted crowd, who lapped up Lanson’s finest, and nibbled delicately at ham hock and some dreadful wobbling beetroot and carrot affair. No doubt the lure of the self-proclaimed ‘most extensive list of champagnes available in the City’ will prove irresistible to the Square Milers, passing through on their way to pick up the latest range of hiking equipment. I enjoyed this service of Mumsnet Thread and the ease of use. I like the choice of items from Argos, It's easy to shop there, and I find that the staff is always cheerful and helpful. He was AMAZING A4 Snap Frames!!!! He is VERY thorough, timely, professional and a great resource. This was my first time buying a frame and he walked us through the whole process. I HIGHLY recommend him to anyone! Great customer service! I called SOSav iPhone Repair DIY Guides and was able to just drop by right away to get my cracked screen fixed. Not only did he offer the best pricing, but he also did the work in no time! He fixed my phone right in front of me which was awesome because I don't feel comfortable leaving my phone with anyone….. The Charminly Country House Agriturismo Hotel give you the possibility to stay in the most unusual locations, also, behind each one of them, there’s a story to tell, people who at a certain point of their life decided to leave their town and job, sometimes profitable but very stressful, to change life, approach to the countryside and dedicate to hospitality with passion and love. John Mighalls Removals secure facility is fully staffed and our in house porters will pack your goods into the containers using furniture blankets, bubble wrap and packing paper to ensure that they are fully protected. Once packed they will not be moved until you require you goods back.